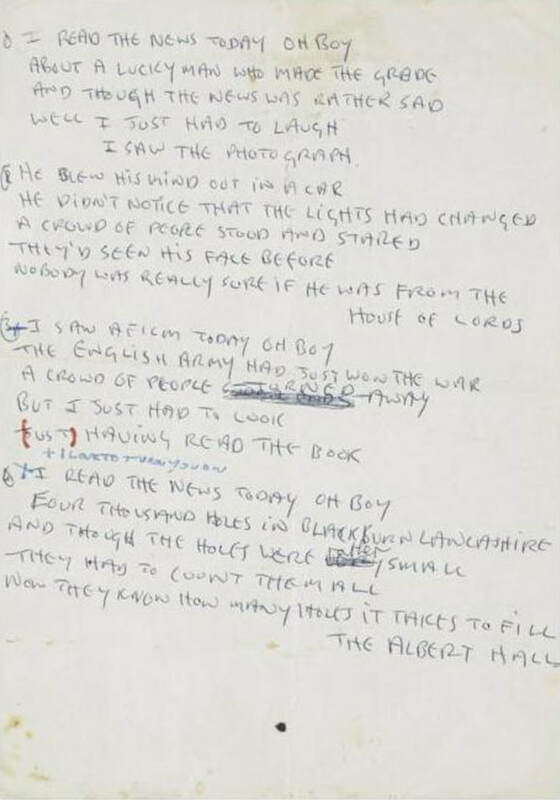 John's original handwritten lyrics sold for $1.2 million on June 18, 2017! An acoustic guitar lesson on how to play “A Day In the Life” by The Beatles | John Lennon from the album “Sergeant Pepper's Lonely Hearts Club Band" released in 1967. I thought it might be cool to try to play the melody and the bass lines at the same time but it didn't take long to realize that that wasn't going to happen in standard tuning...so I tuned the low E string way down to an A so I could get the lowest note that the bass plays. The problem with doing that is the E string was SO loose it was rattling against the frets really badly and just too sensitive to touch as far as the pitch goes. In the end I tuned the guitar up a whole step and then lowered the E string down to a B. That solved all of the rattling and pitch problems! I didn't have an issue with breaking strings but whenever you tune up you're taking a chance that you might break one, so be forewarned. If your strings are newer it won't be a problem. Anyways, I play it a bit slower than the original and doing that I think somehow brings out the beauty of the melody. It has a certain quality about it that's hard to define but you can clearly feel it. I really enjoyed working on this one. It was fun figuring out how to play the bass and melody together. After tuning down the E string it's actually not that tough to do.